If you haven’t realized there are subscription services for EVERYTHING. There are boxes for your furry friends, others to keep your kids busy to boxes for makeup lovers and wine aficionados. Some are great if you are interested in trying a product but aren’t really quite sure just yet while others are perfect for items you need on a monthly basis. You name it and there’s a subscription to it. 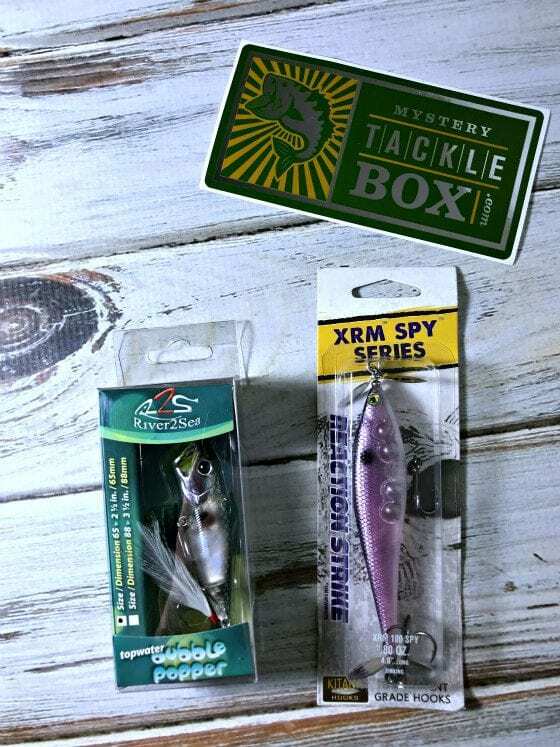 And guess what, there’s even a subscription box for fishing lovers – Mystery Tackle Box. What Is Mystery Tackle Box? Is fishing your go-to for relaxing and having fun? Then I know something you are going to LOVE. 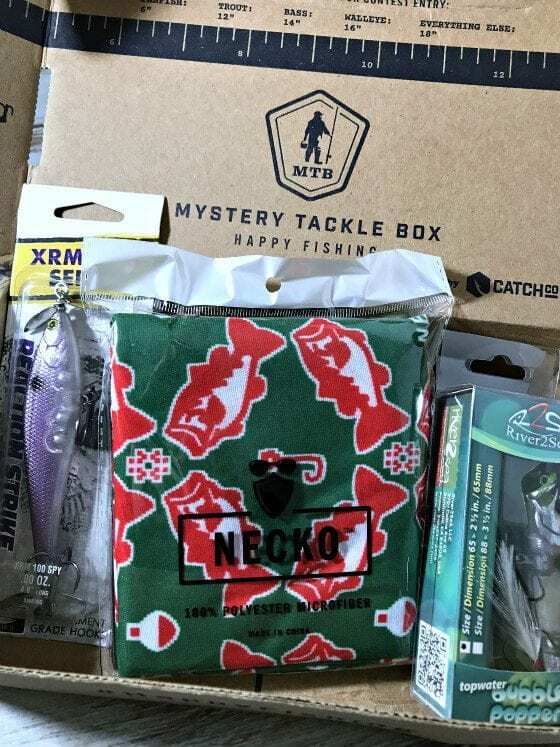 Mystery Tackle Box is a monthly subscription box that has fishing lovers in mind. With each monthly box, you can discover new fishing products and get your reel on. It’s a great way to try new fishing gear without having to go shopping. That means MORE time for fishing! Something I know most fishermen would appreciate. What Goodies Are In A Mystery Tackle Box? You can get all kinds of fishing goodies from big names to small ones. Each box consists of a variety of different kinds of baits that are paired with the species of fish you selected and then you can add on other products like rod gloves, casting sleeves, lines to things like decals or multiuse face shields. Everything I received was of top-notch quality and came nicely packaged. How Much Does Mystery Tackle Box Cost? Mystery Tackle Box is extremely affordable. They offer two plans (Mystery Tackle Box Chose a Plan) – Regular (Mystery Tackle Box - Chose a Species of Fish) and Pro (choose from Bass, Walleye, and inshore saltwater species). The Regular Plan costs $14.99/month which gets you $25 worth of products while the Pro Plan costs $24.99 with a $40 product value. Just by signing up for this monthly fishing subscription box, you are nearly getting double the product value for half the price (ok, around 40%)! For, example my $14.99 box got me $27.22 worth of fishing goodies. How do I know? They include the price value of all the goodies you receive in the box PLUS give you a link so you can learn about those items if you wish. Want to save more? You can even save more by paying 3, 6, or 12 months upfront – up to a 9% savings!! 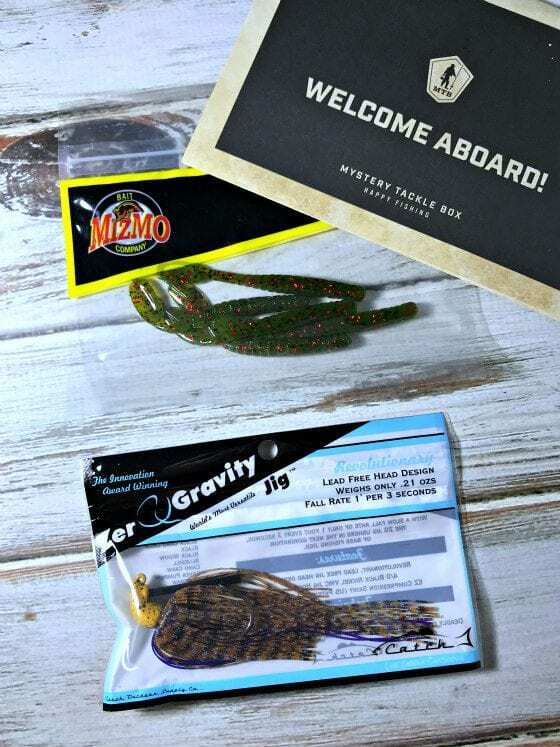 Why Should I Sign Up For Mystery Tackle Box? I think this is a great way to discover new fishing gear you might have otherwise missed. Let’s face it, most fishing lovers are men and they aren’t fond of shopping. Not to mention you can easily learn to use each bait you receive on Mystery Tackle Box’s YouTube page. This means catching MORE fish. Wahoo!! All with FREE shipping and nearly 40% in savings. Need a great gift idea for the fisherman in your life? Mystery Tackle makes a great gift (Mystery Tackle Box Gift Plans)! Choose from a MTB GIFT CERTIFICATE available for bass, walleye, panfish, inshore saltwater, catfish, trout, and ice fishing. This ranges in from $43.50 to $165.00 depending on how many months you select while the MTB PRO GIFT CERTIFICATE ranges from $72-$276. With the MTB PRO GIFT CERTIFICATE, you can choose from bass, walleye, and inshore saltwater species. The recipient will receive month after month of fishing fun! What’s not to love!?!? I totally love this as a gift idea. I already have my fisherman in mind!